﻿ Dirty Sally's Ten Sleep Wyoming Gift Store offering made in Wyoming and USA Crafts, Gifts and Souvenirs including quilts, afghans, baby and kitchen items. 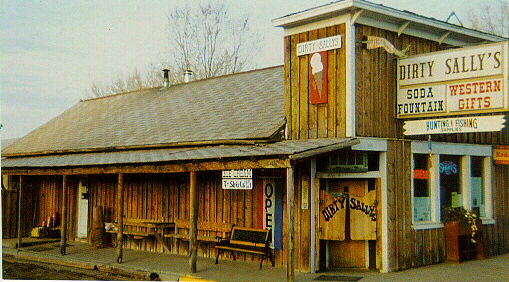 Located on Highway 16, a Scenic By-way to Yellowstone Park via the Big Horn Mountains, Dirty Sally's is an old fashion store with old fashion Malts and hard Ice cream. Hunting and fishing gear is also available as well as Wyoming gifts, handmade crafts and souvenirs made by local crafters. We offer quilts, kitchen and baby gifts, afghans, and many unique Wyoming items for sale. Our rustic building was originally built in 1918 as a bank. Over the years it has found use as a Post Office, Drug Store, Ice Cream Parlor and Gun Smith Shop. Click on the links to the right to visit Dirty Sally's online catalog. We carry a wide selection of handmade gifts and crafts including baby bibs, towels and quilts, afghans, aprons, fleece yarn, jelly's, quilts, rugs, pot holders, table cloths and napkins plus socks.